When you think of Feadship, you might think of some of the largest megayachts in the world. Some classic Feadships aren’t so big by today’s standards. Nonetheless, they were extraordinary for their era. Such is the case with Caravelle, from 1965. She measured an eye-opening 73’8” (22.5 meters) at the time. Equally noteworthy, she was one of seven Feadships bearing design by the renowned Carlo Riva. Later extended to 78’7” (24 meters), Caravelle has emerged from a year-long refit under owners who yearned for a vintage yacht which they could enhance for an even longer life on the water. First, a little history. In the early 1960s, Feadship’s De Vries shipyard and the De Voogt Naval Architects office forged a relationship with Riva. (Riva, a.k.a. “the Engineer,” died in 2017.) Together, they created three yacht series, bearing the names Atlantic, Viking, and Caravelle. Those three series led to several contracts. However, the Caravelle series achieved the greatest success, seeing seven deliveries between 1961 and 1965. Each had a steel hull and powerful twin GM V8 diesel engines, which helped make them faster than most. While the Caravelles don’t hit the brokerage market often, one, christened Quien Sabe in 1965, did a few years ago. Then named Absolute, she came to the attention of yacht buyers pining for a Caravelle. Even though she’d undergone some changes, those changes complemented her classic looks. For example, the above-mentioned extension was one. The then-owners wanted a folding swim platform and a lazarette, features that didn’t exist in the ‘60s. 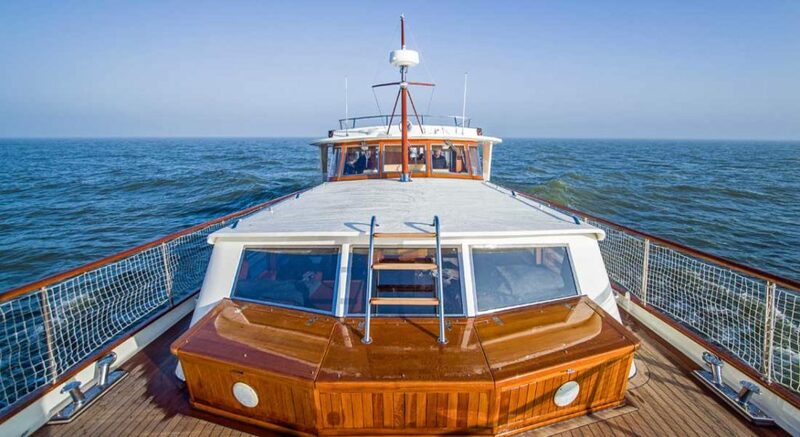 Thankfully, they added the features while preserving the traditional rounded stern, the blue hull, the deck hardware, and teak decking. When the yacht-shopping buyers saw Absolute, they were, well, absolutely in love. 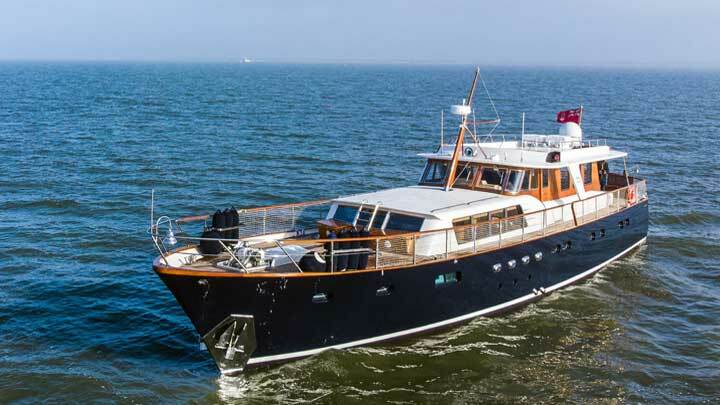 Soon after buying her, they sent her to Feadship for a head-to-toe renovation. Since the 19’7”-beam (6-meter-beam) motoryacht had already lasted 50 years, they wanted her to last many more decades. Therefore, the megayacht underwent extensive work. For example, besides repainting the hull and upgrading the interior, Feadship further upgraded all of the major systems. In addition, it stripped the engine room back to bare metal. In reconstructing the area, the craftspeople added modern-day comforts like four zero-speed stabilizers. Now back on the water as—what else?—Caravelle, the megayacht is the second original Caravelle to seek a refit at Feadship. In 2010, other customers took the fourth in the series to the yard. She cruises as Serena.